Habit: Annual. Stem: branched below, 0.5--8 dm. Leaf: blade < 15 cm, inrolled. Inflorescence: 2--22 cm, narrow. 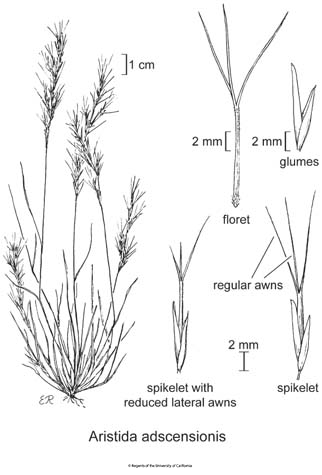 Spikelet: lower glume 4--8 mm, upper 6--12 mm; lemma 6--15 mm, awns +- equal, 7--20 mm, central straight to curved at base. Fruit: +- 15 mm. Chromosomes: 2n=22,33,44. Ecology: Disturbed areas, dry, open places, rocky sites, shrubland; Elevation: < 1400 m. Bioregional Distribution: CCo, SCo, s ChI, WTR, PR, D; Distribution Outside California: to Missouri, Texas, South America. Flowering Time: Jan--Nov Note: Some plants have very short lateral awns. Citation for this treatment: Rosa Cerros-Tlatilpa & Kelly W. Allred 2012, Aristida adscensionis, in Jepson Flora Project (eds.) Jepson eFlora, http://ucjeps.berkeley.edu/eflora/eflora_display.php?tid=14168, accessed on April 20, 2019. CCo, SCo, s ChI, WTR, PR, D; Markers link to CCH specimen records. Yellow markers indicate records that may provide evidence for eFlora range revision or may have georeferencing or identification issues. Purple markers indicate specimens collected from a garden, greenhouse, or other non-wild location.